Any parent could, and would, probably tell you that toddlers can be a mischievous at times. There are toddlers who throw temper tantrums in the store when they cannot have their way. There are toddlers who like to see how many things they can flush down the toilet – even things, unbeknown to them, that have great monetary or sentimental value. There are also those toddlers who enjoy showing off their artistic abilities by drawing on, and coloring the walls of the house, using permanent markers. Then, there are toddlers like two-year-old Leo Belnap who knows how to use a paper shredder. 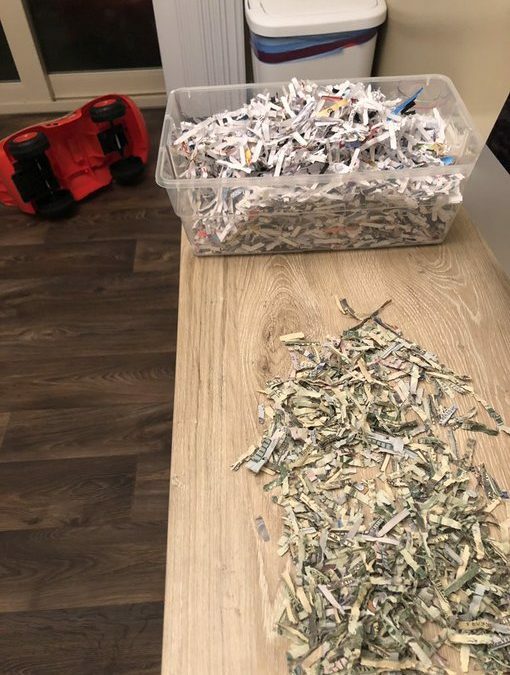 In one of his most recent escapades, albeit he felt that he was helping his parents with a shredding task, Leo accidentally shredded $1,060. Leo’s parents, Ben and Jackee Belnap, from Salt Lake City, Utah, had worked hard all year to save the money to repay Ben’s parents for season tickets to the University of Utah football games. When Ben and Jackee noticed that the envelope containing the money had mysteriously gone missing, they started tearing the house apart, looking in every possible area where the money could have been. News4Utah reported that the couple looked under the rugs, in the drawers, in the couch, and even in the garbage. As Ben was digging through the trash, Jackee yelled out that she had found it – in the shredder – in a thousand tiny pieces. There is hope that the money may not be lost for the couple. The Bureau of Engraving and Printing offers a solution for such a case as this. The Washington Post reports that “the bureau has an entire ‘Mutilated Currency Division,’ which is devoted to ‘redeeming’ burned, waterlogged, chemically altered, rodent-chewed or deteriorated money — a free service to the public.” According to the Bureau’s website, it handles approximately 30,000 claims per year, redeeming more than $30 million in mutilated cash. The instructions on the website state that the mutilated currency “must be forwarded to the Bureau of Engraving and Printing for examination by trained experts before any redemption is made.” Ben told KSL, they contacted the Treasury Department with questions and were told to send the remains of the money to Washington in Ziploc Baggies. They may get the money back that they lost in six months to three years. In the interim, two-year-old Leo will not be using the shredder anymore. Jackee told KSL that this will make a great wedding story one day. *Lead image is taken from Ben Belnap’s Twitter page.